The following is a guide for exercising safely, intended for individuals of advanced age. What is considered elderly is constantly changing, as more and more people take steps to preserve and even improve their health and activity level over the years. Exercise is one such vital tool that can provide tremendous benefits to both body and soul at any age. However, it is important to ensure it is done properly and does not cause injury. This is particularly relevant in cases where the body faces additional challenges, including those appearing in the later years of life. Comfortable dress appropriate to weather is key to maintaining safe body temperature. Keep in mind that advancing age increases sensitivity to both cold and heat. Proper footwear appropriate to activity is key to avoiding muscle strains and even bone fractures. Exercise against resistance or gravity helps to strengthen muscles; this includes floor exercises, weight training, or water sports such as swimming and "water aerobics". "Aerobic" - also known as "endurance" - exercise requires a minimum of 20 minutes each session, with regular, easy breathing throughout. Walking and swimming or "water aerobics" are considered ideal examples for the elderly, in part because they create less of a burden on joints and tendons compared with higher-impact activities. 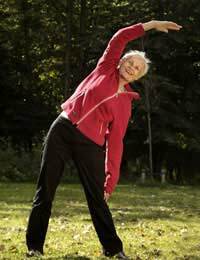 All activities should be done with slow and controlled movements, so as to avoid muscle strain and bone fractures. Warming up is the process of "loosening" and otherwise preparing your muscles and joints for exercise, and is key to maximizing benefits and preventing soreness and injury. It is recommended to take approximately 5-10 minutes for warm-up before each exercise session, increasing the time during colder weather. If you were active for most of your life and have simply been sedentary of late without major illness, getting used to an exercise program now may be relatively easy. However, if you have been chronically inactive or limited by a medical condition, it is best to start gradually - in both difficulty and duration. Slowly build up your sessions once or twice per week toward your goal, adding time and intensity with each increase according to your capabilities. At least 20 minutes per session, a minimum three times per week has been shown to result in increased fitness, and there should not be a push to exceed this if it means overheating, becoming short-of-breath, or feeling pain. Abrupt cessation of physical activity can stress the heart. To reduce associated risks, follow each exercise session with a cooling down period of 5-10 minutes, longer in warmer weather. If you become winded, rest and then reduce the intensity of the activity when restarting. In cases of cardiovascular or lung disease, you may be advised to avoid activities that require you to hold your breath. Stop if you feel pain and assess if you can safely resume, then reduce the intensity or range. Avoid exercising when you are acutely ill, including when suffering from a cold or flu. If exercise is interrupted for more than two weeks, begin again as in the Build-Up above. Muscle or joint pain that do not dissipate with rest. Trouble breathing or excessive shortness of breath. Light-headedness, dizziness, or new difficulty balancing.